Mozzarella… just when you think it can’t get any better… oh, it does. 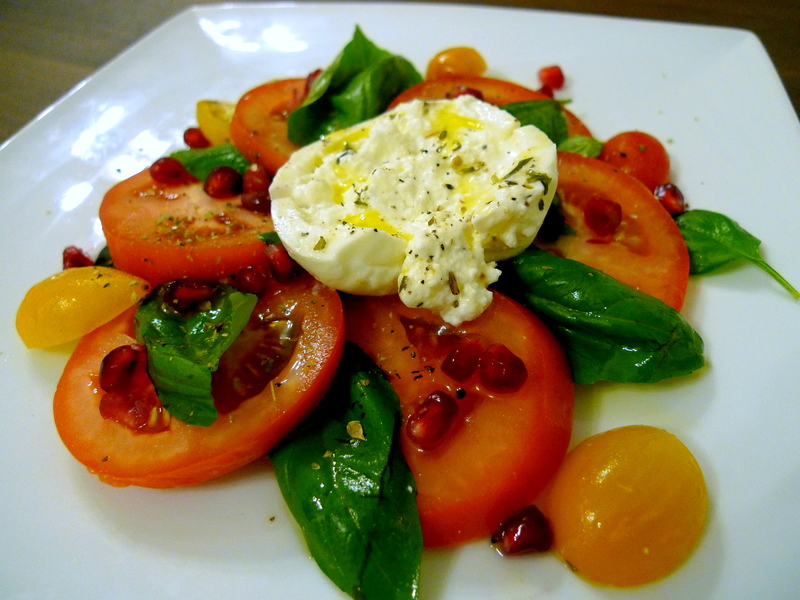 Burrata, which means “buttered” in Italian, is a fresh Italian cheese made from mozzarella and cream. The outer shell is mozzarella while the inside is a mixture of mozzarella and cream, which gives it a soft texture and a rich, buttery flavor. It’s as if mozzarella and cream put on some KC + Sunshine, did a little dance, made a little love and basically got down. Burrata is the ultimate love child of Italian cheese. My favorite burrata salad of all time was from Brick, one of my go-to Italian spots when I lived in Tribeca. It was served with roasted peppers and toasted bread, and it was just simply perfect. But then they stopped serving it, so I moved to Singapore. Anywho, this is a bit of a cheat post because there’s no effort involved in making this salad. Unlike my Housemade Ricotta post, I am not demonstrating how to make burrata because I can’t… I’m just suggesting you buy some from your grocer and throw in some colorful tomatoes. My ideal burrata salad would involve heirloom tomatoes; however, I don’t think those exist in Singapore. So basically I found some yellow Malaysian cherry tomatoes to mix with regular red tomatoes and pretended it had heirloom qualities to it. I also threw in some pomegranate seeds for more color and because I needed to clear them out from my fridge. Layer the tomato slices and basil leaves on a plate. 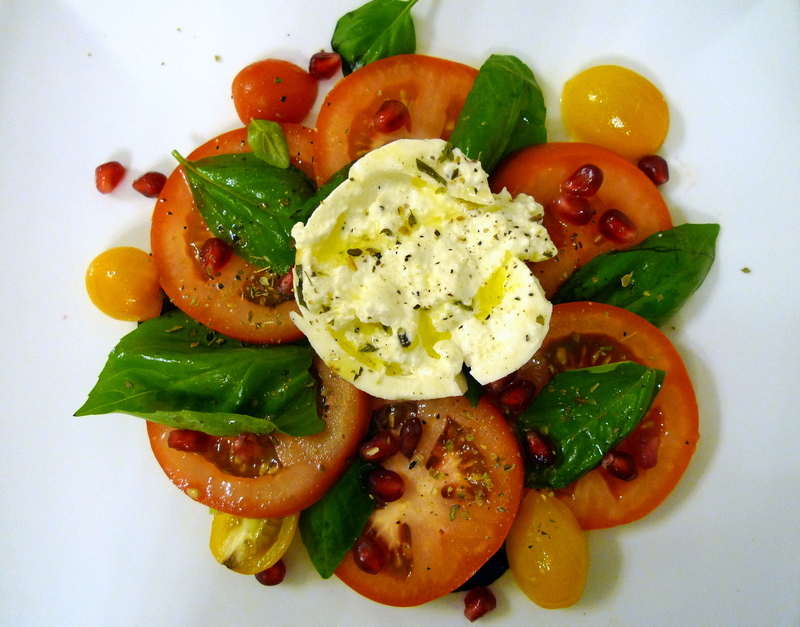 Arrange the cherry tomatoes and pomegranate seeds for ultimate artistic effect. Place the burrata in the center of the tomato mound and break open to reveal the creamy center. Drizzle with extra virgin olive oil, balsamic vinegar (if desired) and season with salt and pepper. Enjoy and creamy richness! 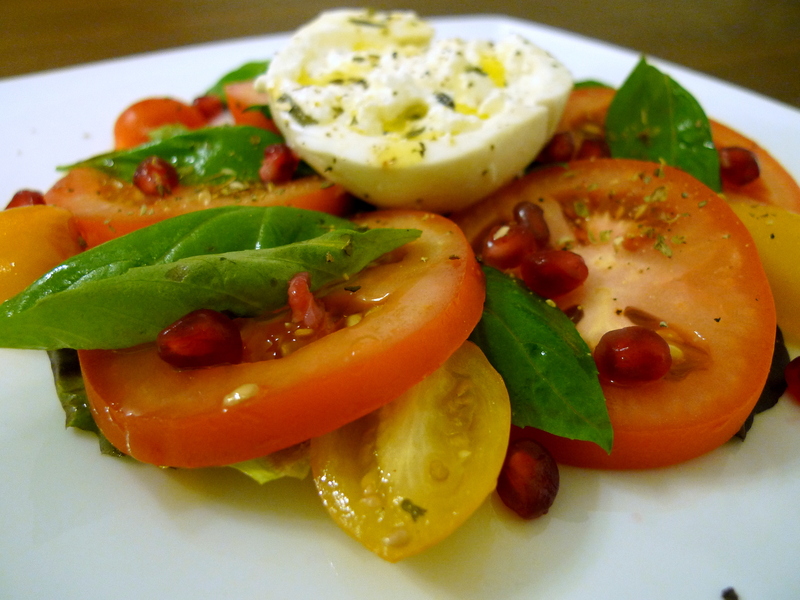 This is one of my favorite salads and the Burrata is so cramy and sinfull.